SpiderWeave.com offers the best E-Commerce Solutions in the industry with Secure Server Certificates from GeoTrust RapidSSL®, QuickSSL®, QuickSSL® Premium. With SpiderWeave.com you will have the complete start to finish E-Commerce Solutions. With GeoTrust RapidSSL®, QuickSSL®, QuickSSL® Premium, True BusinessID, True BusinessID with EV web server certificates, you and your customers can conduct secure Internet transactions with the trust and confidence you deserve. QuickSSL offers true 128-bit SSL encryption – all for less than what you’d pay for other SSL solutions. And unlike other products, you don’t have to wait days for SSL security; GeoTrust will issue your QuickSSL certificate in about ten minutes. RapidSSL® - Issued in minutes, easy set up and install! Ideal for just getting started. 10K Warranty, 99% Browser Compatibility. QuickSSL® - A low-priced, value-branded SSL certificate delivered to you within 10 minutes. 10K Warranty, 99% Browser Compatibility. QuickSSL® Premium - A low-priced SSL Certificate issued in minutes with an extended warranty and a dynamic True Site Seal. 100K Warranty, 99% Browser Compatibility. 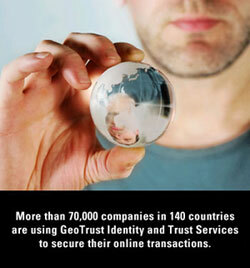 True BusinessID - Trusted protection and assurance to your customers that your site is trustworthy and secure. 100K Warranty, 99% Browser Compatibility. True BusinessID with EV - Only Extended Validation SSL Certificates trigger the green bar in high-security web browsers. 100K Warranty, 99% Browser Compatibility.